According to a Study Released by the National Institutes of Health (NIH), babies born with the birth weight of more than 8.8 pounds (large babies) “have increased risk of cerebral palsy associated with neonatal encephalopathy (Enc-CP).” Newborns that are macrosomic (large for their gestational age) are often the result of gestational diabetes, maternal obesity or another untreated health condition of the mother. Macrosomia (LGA – large for gestational age) can be prevented with appropriate maternal health screening and routine monitoring of the mother’s health during pregnancy. It is crucial that doctors diagnosed macrosomia prenatally and monitor changes using various tools including ultrasounds the estimate fetal weight, amniotic fluid tests, fundal height measurements and Leopold maneuvers (a systematic process for determining fetal position in the mother’s uterus. A failure to diagnose macrosomia and treat the mother accordingly might be considered a deviation from the standards of care and pose a significant health risk to the newborn and mother. The American College of Obstetricians and Gynecologists (ACOG) acknowledges there is a significant risk to maternal and newborn morbidity and children delivered with the birth weight of 4000 g (8.188 pounds). Large babies are typically the result of a high-risk pregnancy that results in birth injuries including cerebral palsy, Erb’s palsy, traumatic brain injuries, brain bleeding, and HIE (hypoxic-ischemic encephalopathy). If your child was considered to be 'large' at birth and developed complications, such as cerebral palsy, contact Rosenfeld Injury Lawyers LLC for a free review of your legal rights and options for a financial recovery. Our firm handles birth injury lawsuits on a contingency fee basis where there is never a legal fee charged unless there is a recovery for you. Macrosomia typically develops in the womb when the fetus receives an abundance of nutrients that might be caused by the mother’s obesity or diabetic condition, especially a gestational diabetic condition. In rare cases, the fetus might be suffering from a genetic medical condition, which accelerates fetal growth. Many factors can increase the potential risk of the newborn suffering from macrosomia. Mother’s Diabetes Mellitus Condition – The fetus can grow inside the womb at an accelerated rate if the mother suffers from type II diabetes (diabetes mellitus). The increase in fetal body weight is often the result of the mother’s elevated insulin and blood sugar levels that overly stimulate the baby’s growth. Mother’s Obesity – Macrosomia can develop during pregnancy if the mother gains an excessive amount of weight was obese before becoming pregnant. An Earlier Pregnancy – Pregnant women who have had an earlier pregnancy have an increased risk of experiencing fetal macrosomia. It is a common occurrence that the 2nd to 5th child born to the same other will have an increased body weight of up to hundred 20 g (4 ounces). Multiple Births – Pregnancies involving multiple gestations (twins, triplets, quadruplets, etc.) have an increased potential risk of macrosomia events. Post-term Pregnancies – Overdue pregnancies, or any pregnancy that takes longer than 40 weeks, increases the potential risk of macrosomia incidents. Older Pregnancy Age – Pregnant mothers 35 years or older have an increased risk of having a baby diagnosed with an LGA condition. Male Babies – In the womb and at birth, boys tend to weigh significantly more (10 pounds and higher) than girls. Genetics – There are certain genetic factors involved in birthing a macrosomia baby including taller and heavier biological parents. Antibiotic Use While Pregnant – Studies of shown that pregnant mothers taking antibiotic medications including pivampicillin and amoxicillin increases the chance of birthing a macrosomic baby. Congenital Anomaly – The increased potential risk of developing macrosomia is elevated if the fetus suffers from a cardiac malformation like transposition of the great vessels. Overgrowth Genetic Disorder – There are certain genetic disorders including Sotos syndrome (overgrowth during childhood, distinctive facial characteristics, delay development, restricted movement, and learning disabilities during the first few years of life) that often presents itself as macrosomia during pregnancy or at birth. Nearly all macrosomia cases involve material weight gain, obesity or diabetic condition. Unfortunately, the larger size of the baby can lead to other birthing problems including shoulder dystocia involving delivery problems when the mother’s pelvis blocks the baby shoulders in the birth canal. 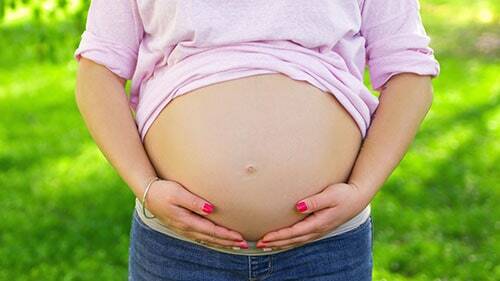 What causes fetal macrosomia in a mother’s pregnancy is an important factor to consider to ensure the child’s health. Pregnant women with known risk factors should talk to their doctor about macrosomia being a concern. The obstetrician can provide different medical options to reduce the potential risk to the child and the mother including controlling weight gain, planning a cesarean section and more. What are the Indicators of Fetal Macrosomia? Polyhydramnios (Overabundance of Amniotic Fluid) – During pregnancy, the buildup of excessive levels of amniotic fluid that protects and surrounds the fetus could be an indicator of a large-size baby. The fluid might be the buildup of excessive urine output by the fetus because larger babies tend to produce more urine. Larger Fundal Height – Obstetricians can monitor the mother’s fundal height (McDonald’s rule) by measuring the size of the uterus to determine fetal growth and take appropriate measures to treat any conditions that could increase risk factors including maternal obesity or diabetes. To minimize the potential of birthing a baby with macrosomia, it is crucial that the neonatal physician identifying the underlying cause of the condition before the baby comes to full-term. In many pregnancies involving macrosomia, vaginal delivery is still an option. However, some newborns are at risk of suffering grave injury if the obstetrician must use tools including forceps and vacuum extractors during the birthing process. In some cases, these instruments can cause traumatic head injuries. Because of that, doctors often recommend a cesarean section (see section) delivery to ensure a successful macrosomic delivery. Many doctors will evaluate amniotic fluid levels after the 39th week to identify any problems that might arise including underdeveloped lungs or other conditions. Uterine Rupture – Serious emergencies can occur during labor and delivery if the mother’s uterus ruptures during the birthing process. In some cases, the uterus will tear open on a scar from an earlier surgery or cesarean section and redirect the fetus out of the mother’s birth canal and into the abdomen. In some cases, excessive pressure or force during the delivery process caused by the excessive baby’s large size can increase the potential risk of a uterine rupture. Many maternal and fetal deaths are the result of a uterine rupture or the newborn suffering fetal asphyxia (hypoxic-ischemic encephalopathy). Typically, the doctor must perform an emergency cesarean section to minimize complications or prevent life-threatening problems. HIE (Hypoxic-Ischemic Encephalopathy) – Fetal asphyxia can be a serious complication in macrosomic pregnancies where the baby’s brain is deprived of much-needed oxygen. HIE often results in permanent injuries including learning disabilities, seizures, Erb’s palsy and cerebral palsy when brain cells die from a lack of oxygen. This condition often develops when the baby is too large to travel through the mother’s birth canal and instead become stuck causing the restriction of essential flow of oxygenated blood to the baby’s body and brain. Brachial Plexus Injury – Babies can develop Erb’s palsy when caught in the birth canal when experiencing a neck tear that damages the brachial plexus nerve in the baby’s upper arm, caused by downward traction. Typically, a bronchial plexus injury because of a force compressing the umbilical cord during the delivery process that restricts oxygen flow and causes a permanent injury like HIE (hypoxic-ischemic encephalopathy). Cesarean Section – Birthing a large baby increases the potential risk of complications associated with delivery if the newborn becomes stuck in the birth canal that can only be remedied with an emergency cesarean section. If the C-section takes too long perform, it could cause oxygen deprivation to the baby and cause lifelong health issues including cerebral palsy. Vacuum Extractors and Forceps-Associated Injuries – Delivery instruments are sometimes used during the birthing process to assist a macrosomic baby who has become more might become stuck in the birth canal. However, when doctors use vacuum extractors and forceps incorrectly, the baby’s head may experience extreme forces that can cause a blood clot or intracranial hemorrhage that leads to brain cell damage, stroke, brachial plexus injury, ischemia, or cerebral palsy. The extreme force can result in skull fractures; I have leads (retinal hemorrhage), brain damage including seizures and cerebral palsy, and brain bleeds involving subgaleal hemorrhages. Post-delivery Bleeding – Mothers can suffer severe uterine atony after giving birth if the uterus failed to contract after the birthing process that could lead to postpartum hemorrhage where the excessive bleeding causes a life-threatening condition to the mother. Cerebral Palsy and Erb’s Palsy – More than 200,000 newborns suffer from Bell’s palsy and thousands more from Erb’s palsy at birth or in the months after their delivery. Cerebral palsy is a health condition identified with spastic paralysis (impaired muscle coordination) and other disabilities. Cerebral palsy is typically caused by brain damage involving asphyxia. Erb’s palsy (Erb-Duchenne palsy is identified with a loss of motion in the arm, weakness, and paralysis because during the birthing process when a nerve and the shoulder neck became damaged. Most newborns with Erb’s palsy became stuck in the birthing canal during delivery. Elevated Blood Sugar Levels – Children diagnosed with macrosomia tend to suffer from impaired glucose intolerance where they experience blood glucose levels that are higher than average. Newborns with this condition often face serious risks to brain injuries. Obesity – Scientists have long known that newborns with macrosomia tend to have a higher risk of becoming obese during their childhood years or throughout adulthood. Metabolic Syndrome – Certain complications can arise in children that have survived a macrosomic delivery including abnormally high cholesterol levels, excess body fat, elevated blood sugar levels, and hypertension. The neonatal physician and obstetrician must monitor the baby and the mother during pregnancy, labor, and delivery to identify macrosomia-related risk factors. When macrosomic conditions are found, the doctor must be prepared for the worst-case scenario that could occur during delivery. Save the lives of the mother and baby might require delivering the newborn early or performing an emergency cesarean section. Not providing the patient adequate information to make an informed consent and how to deal with the risks associated with a macrosomic birth and delivery alternatives. Cerebral palsy and Erb’s palsy are devastating medical conditions that usually requires years of therapy and treatment. Because of that, many families will hold the doctor financially responsible for their negligent actions during the pregnancy, labor, and delivery or when providing postdelivery care to the newborn and mother. If your family experienced a macrosomia delivery, it is crucial to determine the extent of your newborn's condition and the mother’s health to identify any potential underlying cause that harms the mother or baby. The doctor should have discussed the safest options for delivering the child while accounting for macrosomia to minimize potential risks of serious outcomes that could affect the child’s life. Handling these cases in court often involves complex legal issues. An attorney working on behalf of the family can review the mother and child’s medical records and identify any negligence that might have played a role that resulted in a birthing injury. However, time is of the essence. All the necessary paperwork must be filed in the proper county courthouse before the state statute of limitations expires. Contact the birth injury attorneys at Rosenfeld Injury Lawyers today and let us evaluate if your child's condition is related to a large birth weight.